Digital calendars provide enormous benefits over traditional pen and paper schedules. With digital calendars you can schedule your events, set up reminders, manage time, and track your goals. But despite the obvious advantages that digital calendars offer, people still buy paper notebooks for scheduling their daily plans. For some reason a lot of us still prefer planning on paper. Evopaper, a company that we worked with, decided to bridge the gap between paper notebooks and digital planners so people who like planning on paper can also benefit from digital calendars’ undeniable advantages. Founders of Evopaper turned to Yalantis to implement the digital idea of Slice Planner: an app that moves handwritten plans to digital calendars (Google, Apple and Outlook) with the help of computer vision and augmented reality technology. Yalantis helped Evopaper build this app. Merge your paper day's schedule with the one in your digital calendars. Your event titles will be recognized by the optical character recognition powered by Google Cloud Vision. Check whether there are concurrent events in your schedule. All you need to do is hold the app over your paper planner and it will highlight overlapping events. This feature is made possible with the help of Augemented Reality mode. Save important notes by drawing a line around them. The app will capture the outlined section. You can then save, share, or attach the note to one of your calendar events. Send your notes via email, upload to the cloud, or attach to specific calendar events simply by crossing out one of the corresponding icons at the bottom of the notebook page. 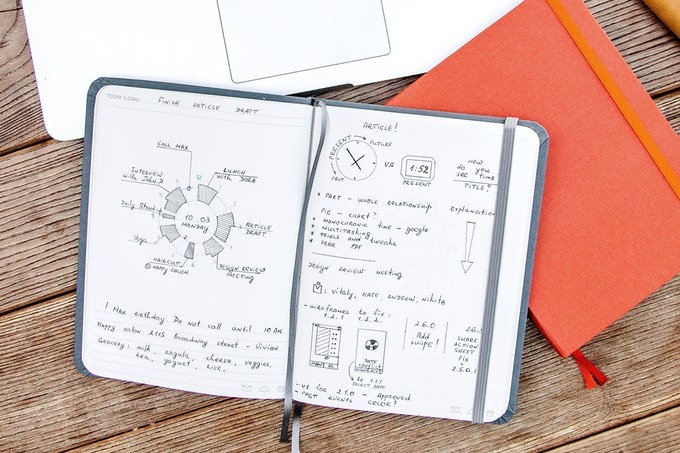 But all these great features wouldn’t be possible without beautiful paper notebooks designed by the Evopaper team. In the center of all the pages you have a circle with wedges protruding from it. You can attach your notes to these wedges assigning your plans to a specific time of day. When something you planned happened, you can just shade the wedge to see how productive you were. With a circular diagram you can focus on one thing at a time. You will never plan a business meeting and beers with friends for the same hour. A circular diagram is indeed a very convenient way to plan! We are very happy to see our clients successfully running their campaign on Kickstarter. There are still a few days to go, but we can already see the proof of concept: quite a lot of people have backed the project. We wish great success to our clients and would be happy to continue working on the Slice Planner app in the future!